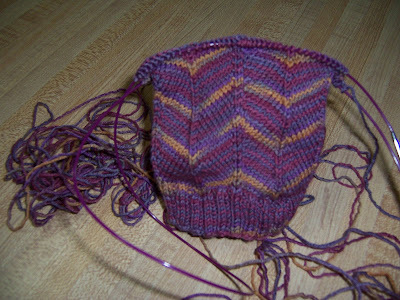 Love the way the chevron stripes are coming out with that yarn. I also have so many mistakes in all of my socks but once they are on my feet, covered by my pant legs, and slipped into clogs - they all fade away! Agreed-Zipper and I-cord after shrinking attempts. Good luck!